So I finally got curious about the accuracy potential of the MAD 33AR and the PTR91. With iron sights, I can do OK but not well enough to make hits on smaller targets. The scope mount I got didn’t quite fit the MAD 33AR, so it went on the 91 even though the BDC is for .223 round. Inside of 500 yards, the differences are sufficiently minor anyway. For 5.56mm, the most obvious solution would be MAD 33kAR with Picatinny rail on the receiver. The eye relief of the 3×30 ACOG is just right, which is good, as the mount permits little variation in position. You can see the faint image of the protective ring around the front sight at the bottom of the sight picture, but it’s not intrusive. Accuracy definitely improved. Groups got smaller by about 50% (close to 2MOA with ball) but, more importantly, the centering of the groups moved much closer to the point of aim. I only wish that the scope had some reticle other than the extra-bright green chevron. Fortunately, quite a few options are available. My top picks would be red cross-hairs or dot-horseshoe, followed by green. Yellow is much harder to see in my environment. I strongly suspect that the main appeal of PSG1 style “sniper” stocks is in moving the cheekbone away from the stock hump. With the rifle as it is now, one has to be careful of the face placement to avoid eventual bruising. But even with the base furniture, PTR91 usefulness improves considerably with a good scope. This entry was posted in rifle, training and tagged 308, optics, scope, Trijicon. Bookmark the permalink. A little extra stock length will move your face back off the hump 🙂 I put one of these on my PTR years ago, it’s served it’s purpose, and has held up well. What specific mount did you use? I have an HK91 with the Stanag scope mount and the Carl Zeiss Diavari-DA 1.5-6X scope. About the best you can do with match ammo is just maybe a hair better than 2 MOA; so, your 2 MOA with ball is excellent. 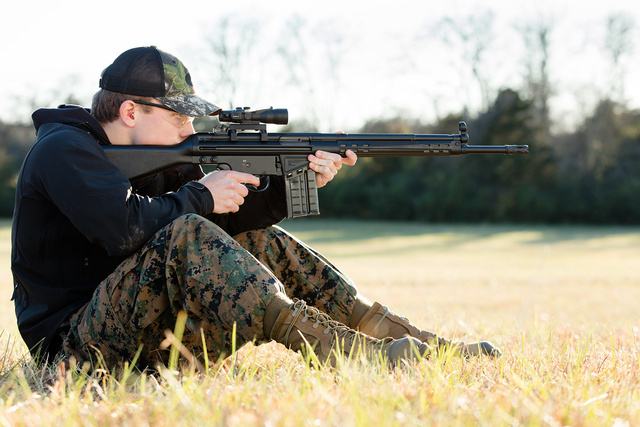 The stock hump should not be a problem, as this rifle, like the M14, was designed to be shot with the shooter crawling up the stock and into the action. Proper placement of the stock in the shoulder and a stock weld should keep the gun from taking a “run” at your cheek bone. There’s simply not THAT much recoil to deal with, IMHO. I also had trouble with the hump, in prone shooting it gave me a good drubbing on the cheek bone when using irons. But once scoped and with a chin riser it became quite a comfortable shooter. A heavy buttpad will also give a little more lop but more important it provides a wider surface against the shoulder with more traction against slippage. A heavy buffer is worthwhile, helps improve controllability, and if you get a clubfoot stock you can (with a little fitting) install the HK21E buffer, which is huge. I have one on a gi model and it’s as soft shooting as an M1A or even a little bit better. And of course a trigger job is nice but not essential. If you’re getting 2MOA or better you’re good to go. The PTR and similar setups are a problem in that regard, but proper long gun architecture has the stock recoiling *away* from your face. That was figured out and beautifully executed hundreds of years ago but in this enlightened age, few remember it. There is a Picatinny rail mount that can be installed on those rifles. It may give you more options for position of the optic. There are longer versions, but they get very expensive, and are most likely intended for multiple night vision optic systems. Atlantic Firearms offers a version of the PTR-91 that has the Picatinny rail already installed. My kids got me one for Father’s Day. You need some high rings to clear the rear sight.